For those of us who have followed soccer here in the US over the years, this year is different. In 2006, your friends thought you were ‘special’ with all your excitement about this World Cup soccer tournament thing. In 2010, more of your friends were into what you were talking about, and Donovan’s last minute clutch goal won a few more over. Soccer? Exciting? But even my own kids – who live and breathe soccer – appreciated the 2010 WC theme song more than the actual tournament. But this year was definitely different. The USMNT may have lost a heartbreaking match against Belgium, but this World Cup may finally be the tipping point for soccer in America. ESPN & Univision have had record ratings both for TV viewing and online streaming. 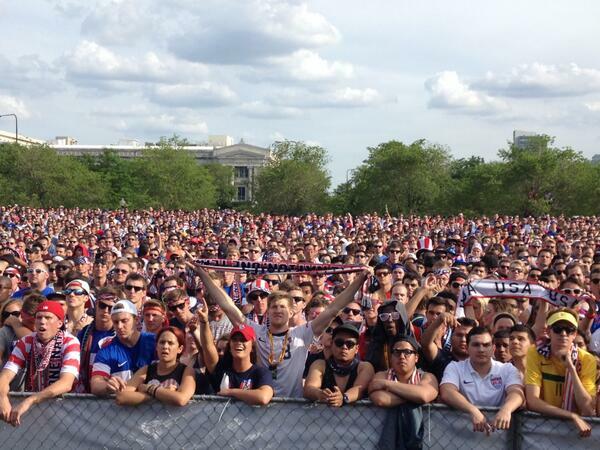 Have you SEEN some of the watch party pictures out of cities like Chicago? 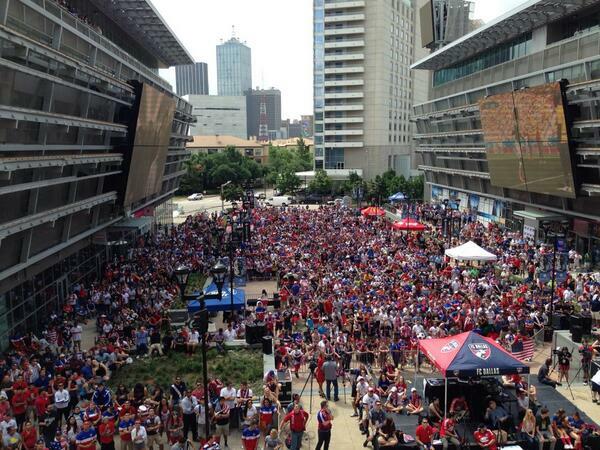 That’s not to watch a sporting event live – that’s to watch it on big video screens. Even here in Raleigh-Durham we had 3,000 people sitting in the NASL Carolina Railhawks stadium to watch the USA vs Ghana match on a weeknight! This has been, by far, the best World Cup EVER. In years past, European teams would often toy with the rest of the world’s teams through most of the group stages. While European clubs do tend to struggle in WC’s played in the Americas, this WC showed the ‘gap’ has closed significantly. Attacking soccer. Lots of goals, drama, and intensity. Teams from smaller nations knocking out legendary teams or giving them a run for the money. I hope this continues in future events. CONCACAF having three teams in the knockout rounds – unprecedented. And given who is still left in the quarterfinals – hopefully US fans will continue to follow what has been an event for the ages and the next few weeks are likely to be just as exciting. 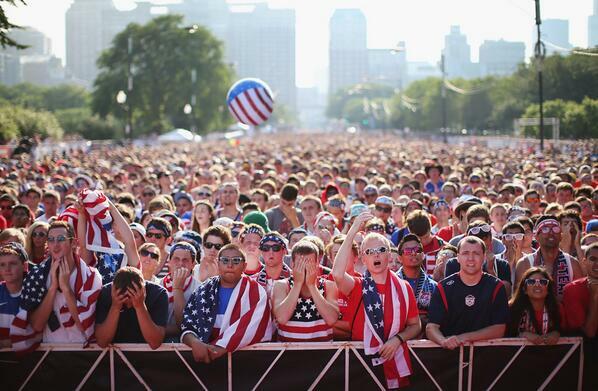 The US seemed to reach a tipping point in following soccer and supporting their team. For a nation that can be so jingoistic, supporting THE national team competing across the globe seems like a no brainer. Regardless, this year was different. 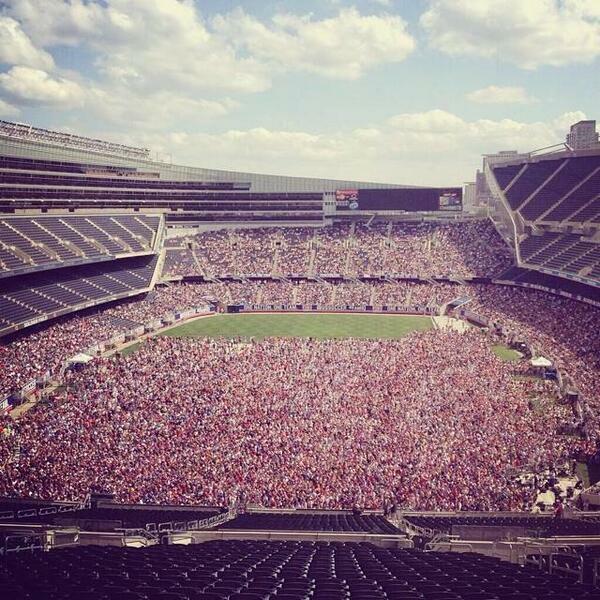 Did you see the crowd at Soldier Field??? Just to watch the game on a big screen? Awesome. 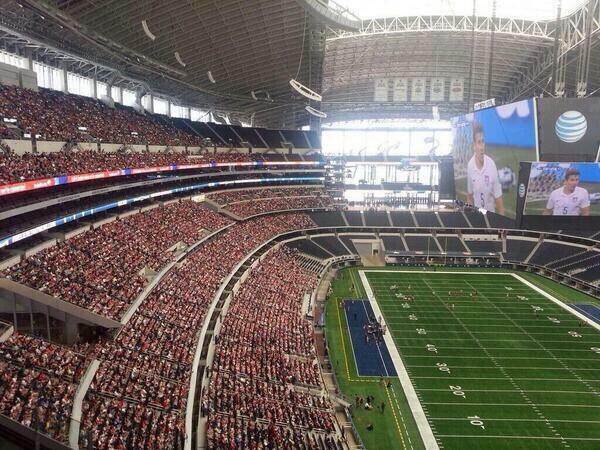 Did you hear the USA chants in the stadium? In Brazil?? 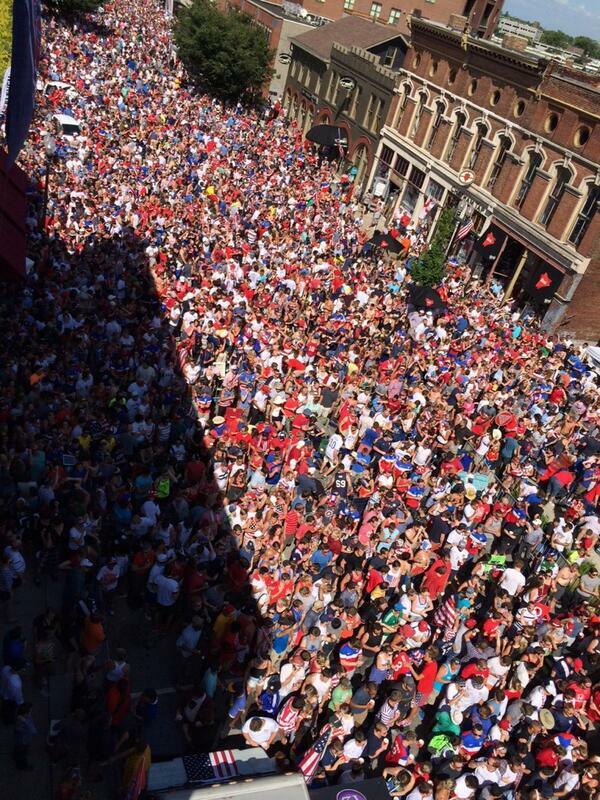 Behind the host country, Americans bought the most World Cup tickets by far and our fans were energetic, vibrant, and fun. Hopefully that will carry back to more MLS and NASL matches. We really need to work towards promotion and relegation in the MLS. I completely understand that the ‘cartel’ style setup was necessary to build a thriving league where so many had failed before. But it’s time to let a couple NASL and USL teams have a chance to make it to the big time. The US Open Cup just isn’t enough. That said – we can’t expect MLS to accept teams being relegated into a league with avg attendance of 4,000 (vs 18,000). 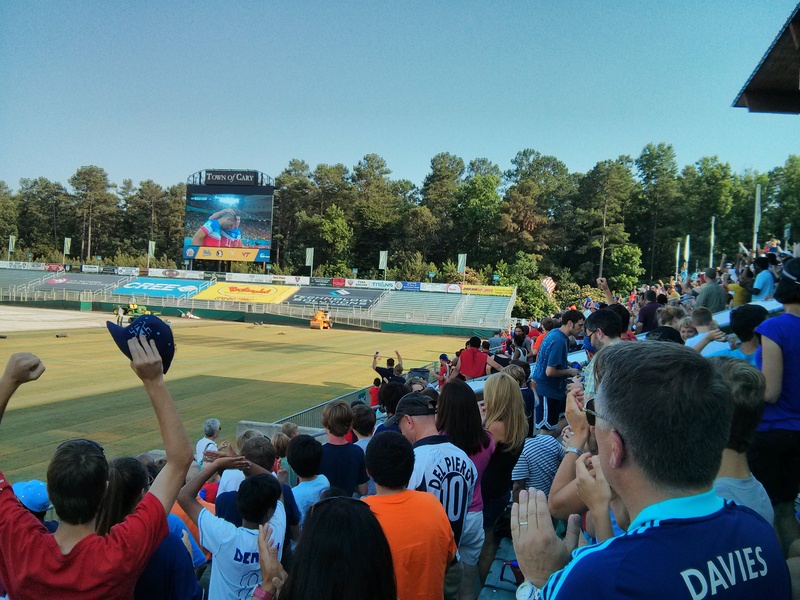 Local peeps – find your way to a Railhawks or Dynamo match! 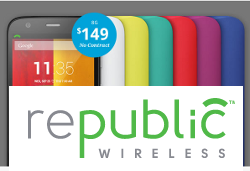 Too bad Soccer.com isn’t a public company. I suspect they made a killing this summer shipping replica jerseys – what an investment opportunity. The Red/White/Blue US away kit is one of the best ever. Don’t forget that you don’t have to wait another 4 years. Coming up??? Women’s World Cup, CONCACAF Champions League, US Open Cup, Olympics, MLS (and expansion), NASL, Gold Cup, Copa America. Before you know it, World Cup 2018 qualifiers will be underway. Jürgen Klinsmann is THE MAN and absolutely should be the one to build us towards 2018. I also hope he’ll continue to work with US Soccer on youth development, just like he did when he coached Germany. Mebane/Burlington needs an American Outlaws chapter. Seeing pics from Mattie B’s in Durham and Cooper’s Ale House in Greensboro made me think we could pack a house given how popular soccer is in Mebane and Burlington. 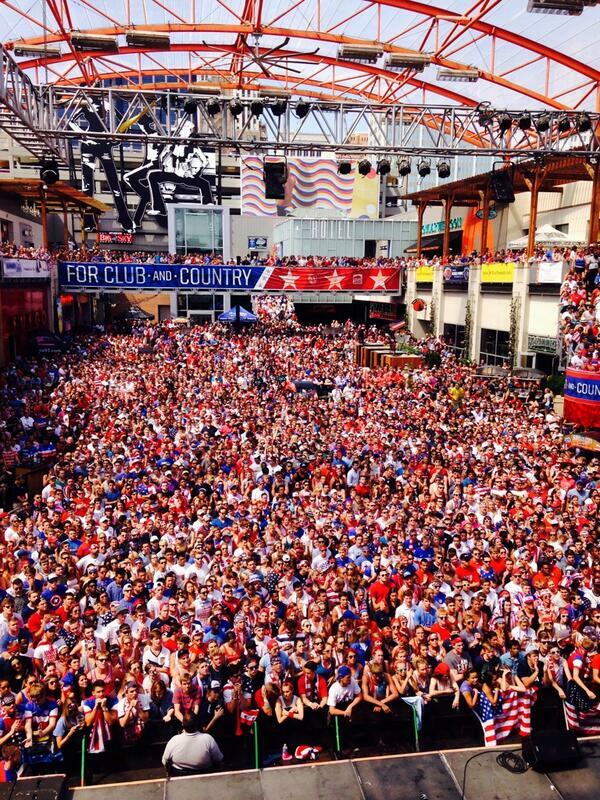 I’m game to organize – who’s up for joining a local chapter and heading to a nearby establishment (and someday a nearby US match or two) to support the USMNT and USWNT? I’m serious. To all the kids playing soccer, do you see how right your coach was when he/she talked about first touch? Our first touch killed us and yet we made the round of 16. Imagine how far we’d go if our touch had been better? During extra time, they all started chanting “I Believe That We Will Win!” Wish I could have grabbed that on my phone. Some have mocked that chant, but for the USMNT this go around? It was perfect. My youngest was genuinely upset when we lost But he’s a die hard Messi fan so he’s all excited about the next round. 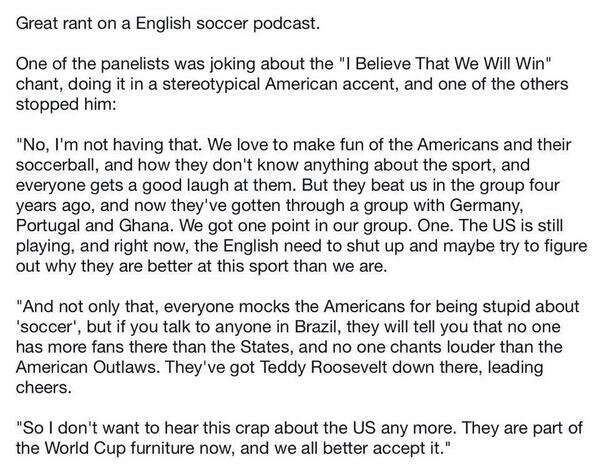 When you’ve earned soccer respect from an Englishman… Yeah… It’s different. As for this @soccerdad? I’m going to enjoy the rest of the tournament then start getting ready for the Fall youth season! Fun post, SoccerDad. thanks for posting the pics of the crowds. Really makes the point. I hope you’re right. We know there will be band-wagoners who will fall away, but this is a great game and we’ve got a bigger foothold now. See ya next year for the women’s version! Nice post. I think it boils down to the fact that American soccer fans have an identity that encapsulates the spirit inherent in this country: Americans love under dogs. I believe this spirit spread to the team and they got out of a true group of death. England on the other hand were out after 2 games…English football needs an identity fast.